Buyers and sellers of vintage relics, divine antiquities and dusty junk. We are selling a vintage set of 4 Triumph hubcaps on Ebay. These measure 9 7/8 inches. We think they are called the dog dish style. Each hub cap has the original emblem. As we understand it, these were made for Triumph models TR2, TR3, or TR4. We found these at an estate sale at an old house in Kentucky that had been closed, since the owner's death, for about 15 years. #1: no chrome loss; great shine; one very small surface dent center left top outer edge; very small amount of little bumps on the chrome in first dip down going from top edge towards badge; badge has just a little enamel loss, colors are very pretty; back of the hubcap has a lot of it's original red paint. #2: no chrome loss; really nice shine; a scratch on side outer edge as well as a small dent; only a handful of little bumps in the chrome in first dip down going from top edge towards badge; badge has very small loss of enamel, great color; back of hubcap has a lot of the original red paint and an area of dried grease. #3: no chrome loss; couple scratches and a tiny dent on outer edge; hardly any little bumps on surface, but this hubcap doesn't shine as much as the others, it has slightly more fine surface scratches; more enamel loss on this badge, but overall not excessive, great color; back of hubcap shows a lot of red paint, some of the paint is starting to lift. #4: no chrome loss; pretty nice shine; a few scratches and small dents on outer ring; has many small bumps and some larger groups of bumps on the inner rings going towards the badge; badge has greatest loss of enamel, but still has more enamel than lost enamel; back of hubcap is shows very little of the original red paint, is mostly rust. We have a huge collection of vintage machinists' tools for sale on Ebay. We are adding additional tools each day, so keep checking back to see what we are offereing. Here are photos of a few items. Click here to see our Ebay store tool inventory. 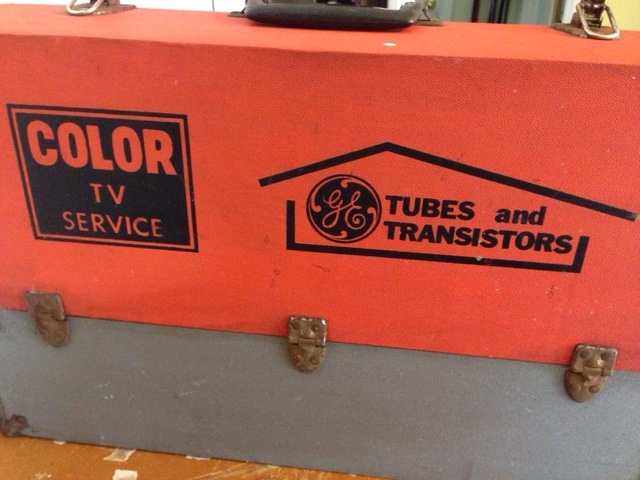 We were fortunate to buy an old color TV service electronic tube and transistors case full of the new old stock (NOS), tubes! 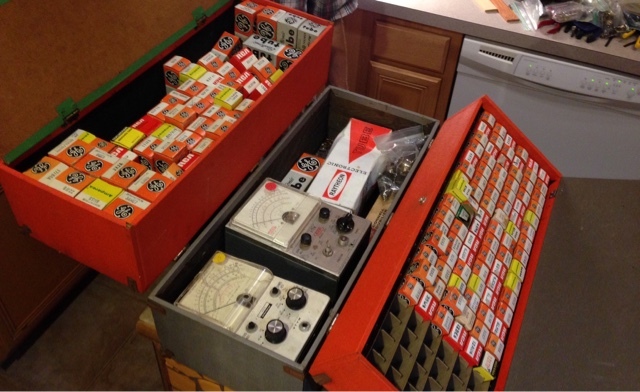 There are a variety of tube makers represented in the collection: GE, RCA, Amperex, Raytheon, Realistic, and Cornell Dubilier (CDE). We have started listing the bulbs on Ebay in both autions and buy it now listings. If you need any of these vintage beauties, please stop by our shop. On many of the tubes, we are also accepting reasonable offers. We have an adorable pair of mid century, 1950's, fish rattle toys for auction on Ebay. Both are made of plastic. The green one has no maker mark, we can still hear the rattle inside, it has no chips, but it has some age crazing. The blue fish has the maker's mark of "Ideal", was made in USA, we can hear the rattle inside and there is something heavier inside, perhaps a weight for when it was used in a bathtub? The blue fish's surface color and paint is really, really nice, there is a small crack starting on one side of the head. These would look great in a child's room. 2 vintage Paulding porcelain bathroom fixtures in deco patterns. One has no socket or pull chain, the other has both - the pull chain works, but we strongly suggest the fixture be rewired. Both fixtures have a plug built into the bottom to plug in an electrical appliance. Both have great porcelain, but the one with the pull chain has a small mold flaw on the bottom edge (see photos). Both fixtures have the Paulding name on the back. We also have two other Fright Factory Listings of just sets of molds (and one listing includes a completed shrunken head). This is a set of 5 antique locks with their matching key. The locks were in the drawers of a beautiful European desk that was destroyed by movers. The desk was over 100 years old. We do not know the exact country of origin, but the family the desk was inherited from lived in Germany. Three of the locks measure about 3 3/4 inches x 2 1/4 inches x about 3/4 inch at the widest point; 1 lock measures about 3 2/5 inches x 2 1/5 inches x 1 inch at the widest point; 1 lock measures about 4 1/5 inches x 2 3/10 inches x 3/4 inches at the widest point (see pictures with ruler). The inside of one lock is covered in dusty fuzz, 2 locks are really clean for their age, and 2 locks have a small amount of dirt - we were reluctant to clean them as we do not know much about locks. The key locks and unlocks each lock easily. On Ebay, we have listed this adorable little Terrier Bulldog that is a bronze souvenir. We think it was made by Jennings Bros., but there is no mark. The bulldog has a shield on it's back that says "State Capitol, Cheyenne, Wyo". It is in really great condition with a beautiful patina. It measures about 2 1/2 inches long x 1 inch wide x 1 1/2 inches tall. Click here to go to the item on Ebay. 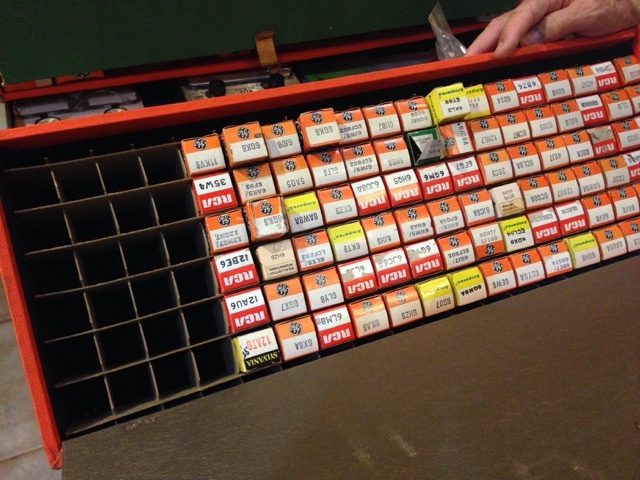 We bought an amazing case of vintage electronic tubes. It looks like it was used very little, and is packed with old tubes. 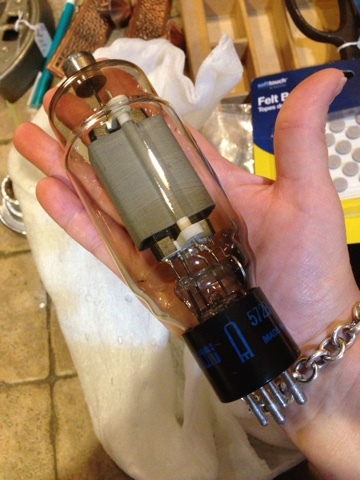 We are slowly but surely listing the tubes on EBay. Stop by and check the collection out! Click here for our Ebay tube listings. SOLD: Tonight on Ebay, we have a great vintage Havana, Cuba collectible. The item is a rare, 1950s Sloppy Joe's Havana Shell Souvenir Boat. The boat was handmade out of shell, wood, and wire. There is a nut and screw that holds the body of the ship to the base of the ship. We cannot detect any damage or repairs to the ship. The shell has a beautiful patina. On the left bow of the ship is carved "Sloppy Joe's Havana". Before the revolution, Sloppy Joe's was a hot spot for rich and famous American movie stars. After the Cuban revolution in 1959, Americans no longer visited and the restaurant/bar struggled. Sloppy Joe's closed in Havana in 1965 after a fire. The ship measures: just over 11 1/4 inches x 12 1/2 inches x just under 3 inches. SOLD: This is a group of really interesting jazz albums. The first two records are really odd. They are both in the same plain white cardboard cover. We do not know if the two records came together or if they just ended up in the same plain white cardboard cover. Each record has a hand drawn / hand printed label - descriptions of them follow under #1 and #2. 1. The plain white record label has the following, hand written on it, in blue marker: El Saturn, Sun Ra (that is on both sides of the label). The engraving in the dead wax area says: first side - Sun Ra B17877A; second side - B17877B. Record has some fine marks on both sides; it also has one very short mark that can be felt with a fingernail. Plain white cardboard cover is in poor condition. 2. This record also has a unique set of labels. What I'm calling the first side of this record, has a colorful yellow, purple, and brown drawing with the letters RA drawn into the center of the little work of art; I'm guessing the art was done with markers. The dead wax on this side of the record is hard to read, it looks like it says: MS706 MS81976A (or does it say MS706 MS87976A). This side of the record has a lot of surface marks, but only one scratch that can be felt with a fingernail that we can detect. The other side of the record has a white label with an abstract drawing in purple marker. The writing in the dead wax is again hard to read, we think it says: MS81976B (or does it say MS87976B). This side of the record has a lot of surface marks, and a couple of very short scratches that can be felt with a fingernail. 3. Super-Sonic Sounds: ABC Impulse Records, AS-9271, 1974. Lots of fine and light scratches on both sides as well as a few scratches that can be felt with a fingernail. Label is in great condition. Cover is in poor condition with overall wear, a puncture mark, a hint of ring wear, edge and corner wear, and a small split where LP goes into the cover. 4. It's After the End of the World: NO COVER. MPS Stereo, BASF 20748, date is 1972. Poor Condition - surface scratches as well as scratches that can be felt with a fingernail. Labels are in really good condition. 5. Jazz in Silhouette, Sun Ra and his Arkestra: ABC Impulse, ASD-9265, date is 1975. Record has a number of fine and light scratches; labels are in great condition. Cover has edge and corner wear, hint of ring wear, a large crease at one corner, small crease at another corner, a puncture, and a split - inside of cover looks good except where the puncture comes through. 6. Saturn presents Sun Ra and his Solar Arkestra: Side A is KH98766, Side B is CPLS5421F, date on cover is 1965. Record has fine and light marks with only a couple of scratches that are deeper, but can barely be felt with a fingernail. Labels are in really great condition. Cover has a crease on one corner, edge and corner wear, a puncture mark (probably from store that sold the record), start of a small split on top edge, touch of ring wear, a small yellow spot on the back of the cover. 7. The Invisible Sheild, Sun Ra and his Intergalactic Research Arkestra: NO COVER, El Saturn, 144000, no date on the record label. Record has some fine, light marks and a couple of deeper scratches that can be felt with a fingernail. Label is in really great condition. There is no cover. For Sale: 5 Antique Desk Drawer Locks With Key, 100+ Years Old! Native American Shoe, 1950's Collectible, Perhaps a Tourist Shoe, Inuit? We have listed a beautiful Native American shoe, probably made for the tourist trade back in the 1950's. We aren't sure which tribe the shoe would have been made by, but our first thought is Inuit. It is just beautiful and can be viewed on Ebay here. SOLD: We are selling a beautiful glass sea shell paperweight. It is signed Lalique France. There is a nice weight to the piece and it is in mint condition. It can be seen on ebay here.